The diversity of plant and animal life has always been a fascination for me. There are over 800 species of wattles, over 700 species of Eucalypts (now being divided into several genera), 340 species of Grevilleas with 50 subspecies, 75 species of Banksias. The list could go on. There are some localities in Australia where the diversity is particularly evident. In Victoria the Grampians and Wilson’s Promontory have a wonderful profusion of plants. I visited Mt. Buller, Mt. Stirling and Falls Creek in the summer of 2005 to see the display in the High Country. It was gratifying to see the Snow Gums recovering from the devastating bushfires of 2003 and putting out new growth from their underground lignotubers. 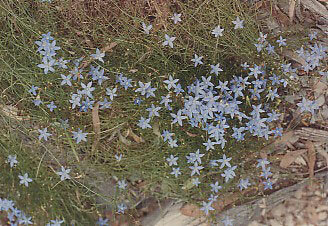 The daisy plants Bracteantha and Brachysombe were prominent, as was the lovely blue/purple Wahlenbergia. My fascination for this diversity of plant life was greatly enhanced in the spring of 2004 when I went on a wildflower tour of the South West corner of Western Australia with a group of enthusiastic native gardeners. This area from Kalbarri in the north to Esperance in the south and Hyden in the east to Margaret River in the west, is one of the richest areas in the world for diversity of plant life. 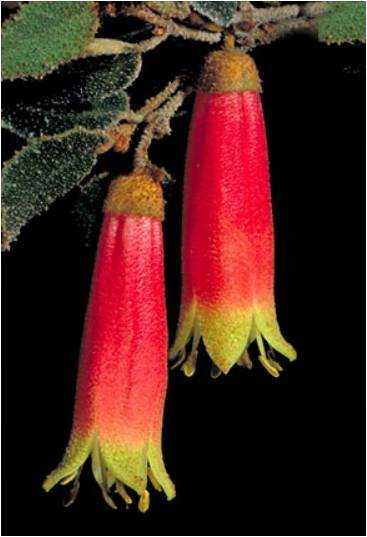 Eighty percent of the plants here grow nowhere else in the world – they are endemic to the South West. The beauty of the plants here is overwhelming with their bright colours and pleasing shapes, and what adds to the fascination of these botanical wonders is that many of them grow in very inhospitable conditions – sand, gravel, hot summers with five or six months of little or no rain. This South West corner of Australia became isolated from the east about a hundred million years ago and the plant life there evolved its own unique genera and species. Creation is the book that God began writing 15 billion years ago and is still writing. Creation is God’s website. The amazing diversity shows how wonderfully creative God’s mind is. The conversation between scientists and theologians about just how the Creator is involved in the evolution of animal and plant life is a continuing discussion. John Polkinghorne, mathematician, physicist and Anglican priest, suggests both chance and necessity are involved in evolution. He says, ‘A fertile world must be neither too rigid nor too loose. It needs both chance and necessity. Chance is the engine of novelty. Necessity is the preserver of fruitfulness’. (Quarks, Chaos and Christianity, Triangle Press, 1994, p. 40). By chance, Polkinghorne means slight variations in the distribution of matter in the early universe, climate variations, the randomness of pollination . . . By necessity he means the ‘laws of nature’ – gravity, chemical reactions, gene and DNA behaviour. 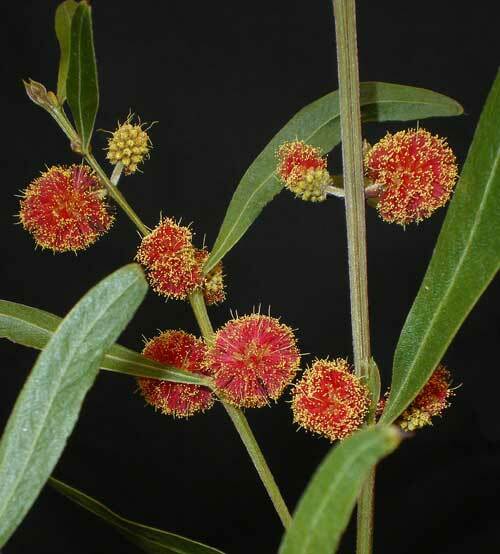 A few years ago a single specimen of a red wattle was discovered east of Melbourne. How did this one shrub of Acacia leprosa, which has yellow flowers, get its unique red colour? Some chance ultra-violet ray striking the seed? Some unusual occurrence in the DNA? At any rate this plant has now been propagated and is available commercially with the name ‘Scarlet Blaze’. I think this would be a good example of a plant evolving by chance yet following the ‘laws of nature’. I believe the Creator Spirit is involved throughout the process of evolution in a way we will never fully comprehend, though this matter is high on the agenda of scientists and theologians who speculate on this interface. If the Creator Spirit stepped aside and left the plants entirely on their own they would cease to exist, there would be nothing. My suggestion is the Creator Spirit encourages the evolution of plants and animals. One of the key aspects of evolution is the survival of the fittest. Those species that are most suited to the environment are the most likely to survive. In the case of the South West of Australia, the plants that ‘preserve their fruitfulness’ (Polkinghorne’s phrase) in the harsh conditions of poor soil and a hot, dry summer will thrive. Those that cannot will perish. But I feel there is something else involved. Not only do these plants survive – they are beautiful. ‘Survival of the fittest’ seems too pragmatic, too cold, too inadequate to be the complete answer to this natural wonder. The Giant Spider Orchid is a truly beautiful plant with its very long, delicate threads hanging down from the flower. The beauty and the extraordinary range of colours in the scores of different plants in the untouched bushland near Hyden, WA is breathtaking. 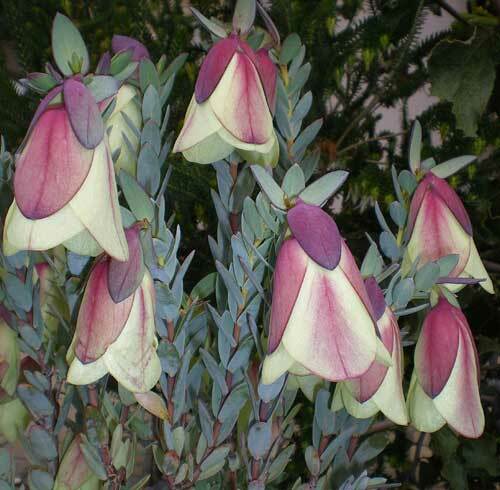 The Correas are a large genus of lovely plants that have shown through the recent drought they are hardy as well. The flowers in the Victorian Alps can endure below freezing temperatures and are truly beautiful. To take up Polkinghorne’s phrase about the ‘engine of novelty’, a plant that endeared itself to me is the Wreath Lechenaultia in W.A. which does actually grow in the form of a wreath about thirty centimeters in diameter with the flowers only on the outside rim. Remarkably it grows in sand. Another ‘novelty’ is Anthotroche walcottii which has a black flower – the ‘engine of novelty’ must have been at full revs to produce that one! Then there is the aptly named Resurrection Plant which seems to die off completely in a dry spell but regrows at the first rains. What factor produces not just survival but beauty and novelty? I think this is where the Creator Spirit makes her presence known. She encourages an evolution which is not only survival but delights the human eye. Did the Creator Spirit bring about the evolution of these beautiful plants for the sake of humans who would come along millions of years after they evolved, even though there would be no one to admire them during the intervening millions of years? At the risk of being too anthropomorphic, I like to think the Creator Spirit encouraged this proliferation of beauty so that she could admire it herself and get that feeling of satisfaction that comes from having done something beautiful and occasionally novel. Consider another novelty: the underground orchid which grows and propagates hidden in the soil. It had no human admirers at all until it was discovered by a farmer plowing his paddock near Hyden, WA in recent times. The Macrozamia is a large palm-like plant up to four metres high with arching fronds to two metres long. 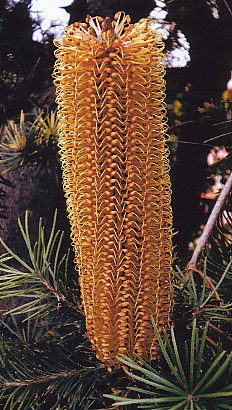 At the base of the fronds are large cones with seed which emus relish. This helps to propagate the plant as the emu droppings which contain the seed then get a great start to life. To prevent emus getting to the seed before it’s ripe, the plant puts a very hard spike in place to protect the unripe seed. This spike lifts up and out of the way when the seed is ripe. What an awesome symbiosis! How did it evolve to benefit both the plant and the animal? I think this phenomenon indicates the influence of the Creator Spirit. rejoicing in his inhabited world and delighting in the human race. My own native garden in Melbourne is a delight to me. 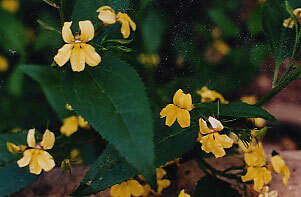 Many of the plants are local to the area, such as the yellow flowered Hop Goodenia (Goodenia ovata) which flowers most of the year and the Gold Dust Wattle (Acacia acinacea) which puts on a wonderful display in the spring. Though all the states are represented, I would like to have many more of the spectacular West Australian plants but most cannot cope with Melbourne’s grey days, summer humidity and heavy clay. However, I have some areas that get full sun and have raised beds to give the good drainage which is so essential for those that grow naturally in sand. Geraldton Wax and some of the Kangaroo Paws do well. Lechenaultia El Dorado is one of the few Lechenaultias to grow here. Among the Feather Flowers, Verticordia plumosa survives reasonably well. In the garden I see myself as a co-worker with the Creator Spirit. I try to set up conditions as near as possible to the area the plant comes from: shady areas for the under story plants; sunny, well drained spots for those that come from arid areas. I have to confine my choice to species that will grow in clay but if I particularly want a plant that can’t tolerate clay I put it in a tub with potting mix. In the garden, phrases come to mind from the prayers over the gifts in the Eucharist. ‘. . . bread . . . which earth has given and human hands have made’, ‘wine . . . fruit of the vine and work of human hands’. A garden is a combined effort of the Creator Spirit and the gardener. The Creator Spirit provides the plants, the soil with its nutrients, the sunshine and the rain. The gardener plans the layout, puts the plants in, tends them especially through the first summer, removes the weeds, prunes after flowering, gives the correct amount of watering. But the ‘work of human hands’ goes much further than this. Propagation contributes to the enjoyment of gardening. I have grown many of my plants from cuttings. Not all my efforts have been successful as the cuttings from certain plants such as Bird Flower (Crotalaria laburnifolia) just will not make roots, so you have to respect this limitation, part of the ‘necessity’ that John Polkinghorne talks about. A more sophisticated form of propagation is tissue culture which is used for difficult species. 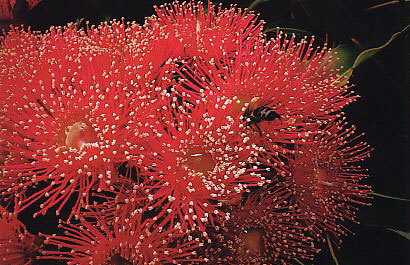 I understand this was the method used for the wattle Scarlet Blaze as there was no seed available and cuttings are not successful with this species. The one-off parent plant has since died, but its progeny live on thanks to the genius of horticulturalists. This random mutation which otherwise would have been lost forever now lives on in many of our gardens. Another ‘work of human hands’ is grafting which has made many plants more reliable. 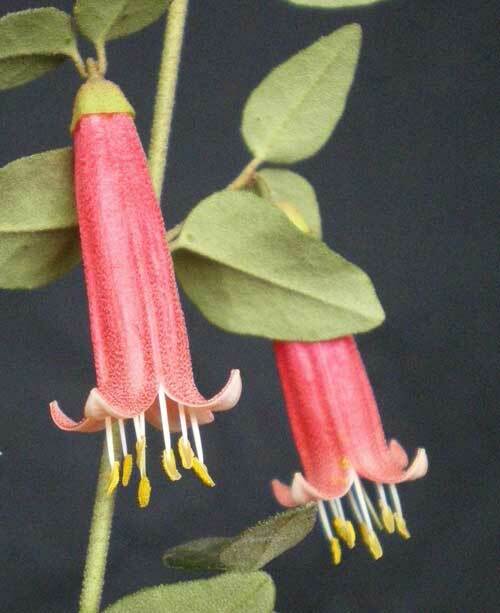 One of my winter joys is the beautiful Qualup Bell which is grafted onto a more reliable root stock and so becomes a delight far away from its native habitat in sandy Western Australia. The clever hybridizing of species provides greater reliability and longer flowering times. The hybrid Grevillea, Robyn Gordon, flowers most of the year and is one of my delights. People have been hybridizing exotics such as roses, camellias and azaleas for hundreds of years, so the hybridizing of Australian natives is still in its early stages and we can look forward to some exciting plants to come as ‘human hands’ continue to collaborate with the Creator Spirit. Scientists at Kings Park in Perth have been researching the benefits of smoke for the germination of plants. They have isolated the essential component and have found that the tiny concentration of one gram per hectare can stimulate germination not only in flowering plants but in food crops as well. This work of human hands will bring immense benefit to humankind. Getting your hands into the soil is to be in contact with the elements that give us food for our survival and beauty that pleases the human spirit. You are touching the very pulse of life, the heart-beat of nature, the life-giving forces of the earth. A gardener may not consciously think of God while in the garden, may not even believe in God, but to provide assistance to a beautiful plant to come into its flowering glory is a spiritual experience putting you in touch with ‘the power greater than yourself’ and is refreshing for the soul. For some it may be a substitute for going to Church which is out of favour these days. I sometimes think of myself as an artist working with living material. I paint the landscape of my garden with colours and forms that are alive and growing. Recently I have tried putting together plants that are a pleasing colour combination. A chance success was the planting of the delicate blue-bell, Wahlenbergia communis, under a scarlet red bottle brush which turned out to be a lovely combination. I have put a red flowering creeper, Kennedia beckxiana, behind a white Geraldton Wax. I try to blend into a harmony the differing sizes and shapes of plants. At least I can place the smaller ones in front of the bigger ones as an elementary contribution to landscape gardening. Sometimes I see the garden as an orchestra with each plant as an instrument playing its own line of the score. Together the plants play a symphony, the trees and large shrubs forming the bass, medium shrubs the middle lines while the small shrubs and ground covers provide the treble. Real sound is produced by the birds that gather the pollen and nectar from the flowers. The garden teaches me detachment. You cannot afford to be attached to any plant as they can die unexpectedly in spite of careful tending. Boronias are notorious for dying on you, even though you place rocks around them to provide cool areas for the roots. We have yet to learn the secret of keeping many of our natives in cultivation. The Lechenaultias may only last three or four years in Melbourne so you take cuttings and replace them. Plants may die if you look after them too carefully – some thrive on neglect. It may have been over-watering that was fatal to a little paper bark, Melaleuca pentagona, that was given to me a few years ago. We also need to have confidence in the ability of natives to survive without fertilizer. Phosphorus was leeched out of Australian soils millions of years ago and our natives have evolved without the need for phosphorus. In fact, they are generally intolerant of phosphorus, a component of most fertilizers. However, the mulch which is so important for retaining moisture usually provides sufficient nourishment as it breaks down. We can trust this natural process provided by the Creator Spirit. The God of Diversity inspires me to have as many different species in my garden as possible. I have about 300 different species at present and plan to have more as I grow them from cuttings or receive them from friends or as my budget allows me to purchase. I have 14 different wattles, 5 Banksias, 8 tea-trees, 10 Correas, 5 Eucalypts, 15 Grevilleas. Professional landscape gardeners advise having a swathe of the same plant or repeating the one plant in different parts of the garden, like a rondo in music. However, it’s diversity that I like and in my limited space I prefer to have as many different plants as possible. My concession to the landscape gardeners is to have a line of five Dwarf Baekea virgata as an edging and several scattered Mountain Daisies. The very nature of the plants and the seasons teaches patience. With a sense of excitement you put in a new tube-size plant but you may have to wait months or even years before the plant comes into flower. A Pin Cushion Hakea planted three years ago has still not flowered. Others grow amazingly quickly. 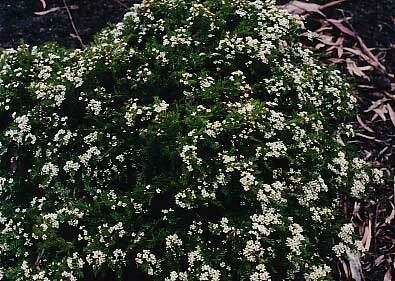 Cuttings from Myoporum floribundum, a large shrub with narrow pendulous leaves and white, starry flowers along the top of the branches like snow, flowered in two years and was two metres high. The Creator Spirit gifts us not only with beautiful flowers but sometimes the foliage is the attractive feature of a plant. 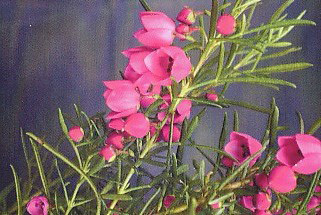 There is a lovely little tea-tree called Leptospermum lanigerum which has delightful reddish stems and small blue-grey leaves with a tiny purple edging. Another favourite is Hypocalymma cordifolium which, as the name implies, has lovely heart shaped leaves that are light green. Other shrubs have very pleasing shapes. One that draws a lot of comment from visitors is the wattle, Green Mist, with its drooping branches forming a wonderful dome shape about a metre high. Similarly dome shaped is the Mountain Daisy, Ixodia Achilleoides. However, many natives get straggly or leggy if they are not pruned into a good shape – another task for ‘human hands’. 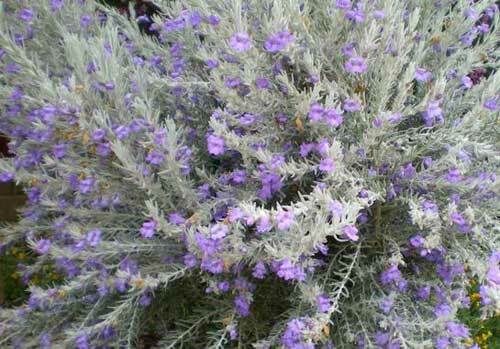 Some plants such as the Eremophila nivea and Rulingia grandiflora have delightful, soft, velvety foliage, a joy for the sense of touch. However, some species of Hakeas and Grevilleas have thorns or very stiff foliage as a defense mechanism which says ‘hands off’. 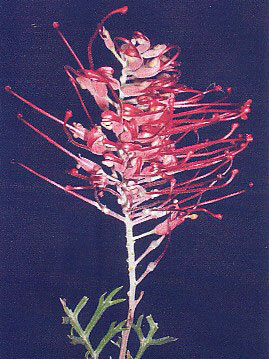 One Grevillea earned the species name ‘armigera’ which means ‘bearing arms’ or ‘war-like’, it’s so fearsome. Different touches, shapes, aromas and colours make a wonderful diversity. 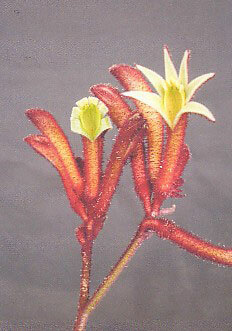 I joined the Australian Plant Society some years ago and get immense satisfaction from enthusiastic friends there. This branch gets up to a hundred people at a meeting which is always exciting, with excellent speakers showing wonderful slides. Members bring along whatever is in flower at the time for the ‘specimen table’ and share their experience on how best to grow these plants. A ‘community’ forms around the specimen table. I don’t see my garden as ever being finished. As I discover new plants that catch my attention or new techniques for growing, so I make space which may mean taking out one for which I have a duplicate or one which is doing poorly. This is part of the creativity of gardening – it’s ever-changing. The botanical names can be a stumbling block for many, but there is no reasonable alternative. 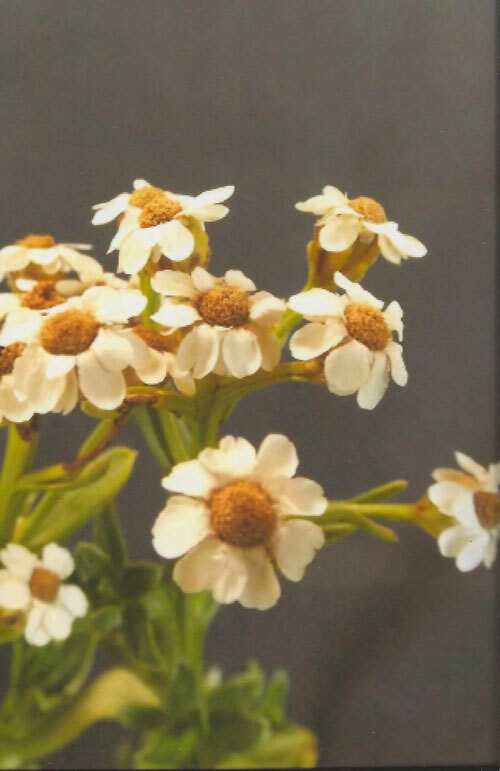 The sheer number of plants makes it quite impossible to have common names for all of them but garden enthusiasts manage to learn the names gradually as they hear them being used or read the literature. I take a particular interest in the names because I regard the plants as my friends and you always like to know the names of your friends. How big is my garden? Imagine two suburban blocks together with a path down the middle and four single story units on each side with a small garden around each. The main part of the garden is from the street to the first units, about ten metres deep and on a good slope – enough to keep me busy one day a week. An important part of my spirituality is the recognition that I don’t ‘own’ the land, nor does the institution I belong to ‘own’ the land. I am aware the aborigines lived on this land for tens of thousands of years, and even they didn’t claim to ‘own’ the land. If we reduced the age of planet earth to one year, humans only appeared in the last 40 minutes and white people came to Australia only in the last one and half seconds! Australia was once joined to all the other continents forming Gondwana, and has had an amazing history of movement around the planet and has gone through many different geological changes over millions of years to come to its present rather dry and eroded condition. Our legal system says my institution ‘owns’ this land, but in the broad perspective of evolutionary time, only the Creator Spirit ‘owns’ the land. As steward I try to beautify this little patch with plants indigenous to Australia. In recent years gardening has become an important part of my spirituality and the God of Diversity is my inspiration.